On Friday night, I had a couple of friends come over to do a little stamping. They had seen the Strength & Hope card that I had CASE-d (you can see the original card HERE) and wanted to make it. 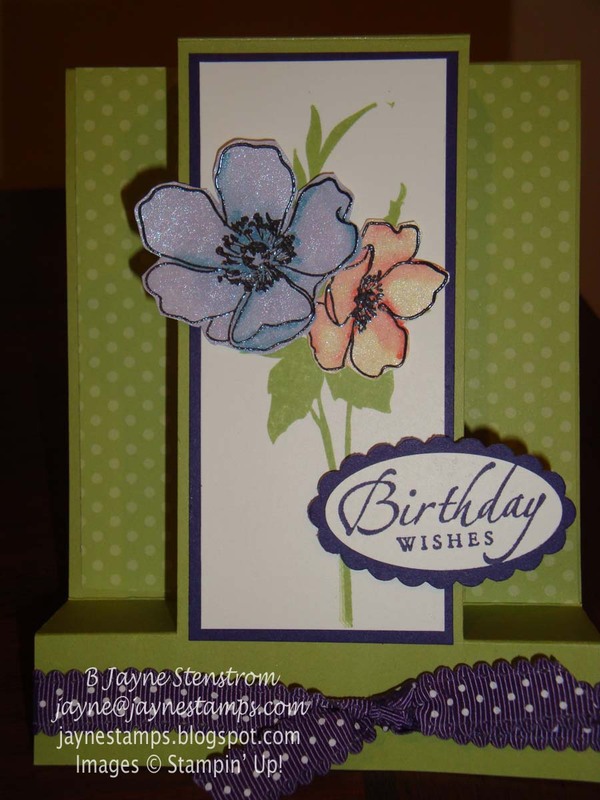 The original card was made with Certainly Celery and So Saffron card stock, so I decided to make mine a little different by using Marina Mist and Bashful Blue. 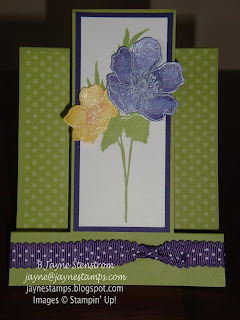 I love the way this card turned out in these colors! 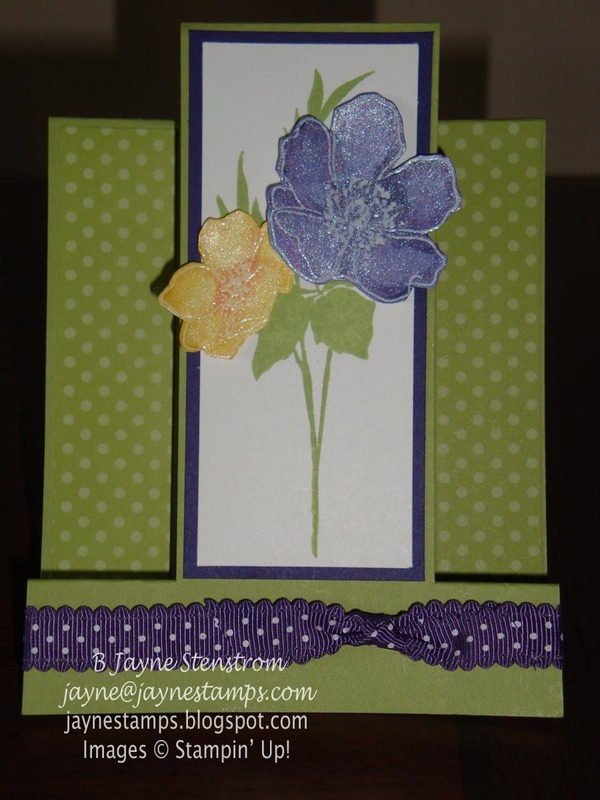 We couldn't just make ONE card though, so I taught them how to make this stair-step card using the Fabulous Florets stamp set. I've posted this card before HERE. We also used the same technique of "spray painting" the flowers. I described how to do that in the same posting. We changed up the colors just a little bit, using Pear Pizzazz as the main card color. And when we had all decided to use the polka dot pattern from the DSP stack, I knew the new 1/2" Scallop Dots Ribbon would be the perfect accent! It comes in ten different colors and adds such a playful touch. Here is Carol's card. I wanted to show it to you because of the colors that she added to her smaller flower. The picture just doesn't do it justice. 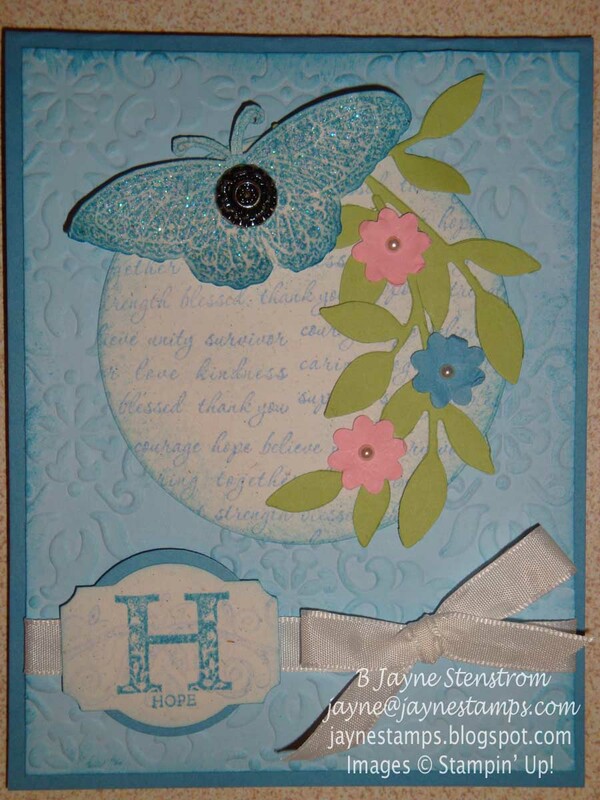 Just to try a little something different, I embossed my flowers in white. It's not as striking as the black, but it has a softer effect to it. I didn't add any greeting yet. I like to hang onto cards like this and wait to add a greeting when I know who I'll be sending it to. So if you're a stamping friend or not, I hope you enjoyed seeing our cards!